Description Of Item: Get ready for a battle of prehistoric proportions! This awesome robot-to-beast figure converts from MAXIMAL warrior to PREDACON beast with the push of a button! 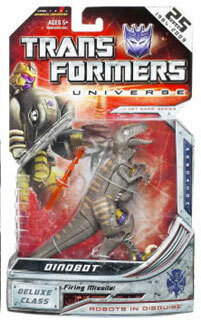 Launch missiles in robot mode or unleash a vicious-looking Velociraptor dinosaur in beast mode. It?s a battle where only the strong survive ? and only you decide who will win!